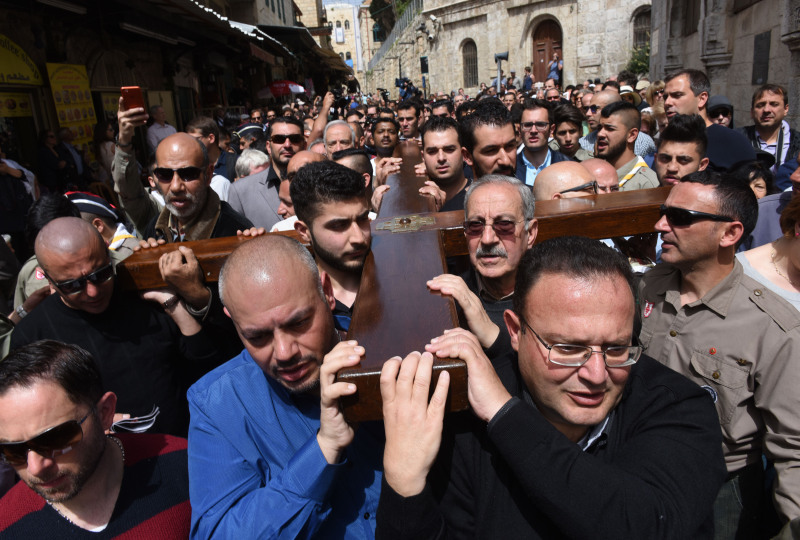 Mousa Kamar, front right, at the head of the cross, and his son Youssef, diagonal to his father, in the corner of the cross, helps carry a large wooden cross during the Good Friday procession on the Via Dolorosa in Jerusalem's Old City March 25, 2016. Mousa Kamar and his sons are carrying on the tradition of his grandfather and father, carrying the cross on Good Friday. JERUSALEM (CNS) -- For four decades, Mousa Kamar has taken his place at the head of the heavy wooden cross used during the Franciscan Good Friday procession on the Via Dolorosa. "We do this not only because it is the tradition, but because we are religious and we truly believe in it," said Kamar, looking over some of the photographs scattered on a coffee table as he sat in his mother's living room in Jerusalem's Old City, near the ninth station of the cross. This is the home where he grew up and where his paternal grandmother was born. "When I am carrying the cross I remember Jesus, how he died for us and how he walked all this way by himself," said Kamar. "We are 20 people carrying it, and he carried it by himself. Especially as we stop at each station and it is mentioned where he fell (or other detail), it makes me feel like I am following the footsteps of Jesus." 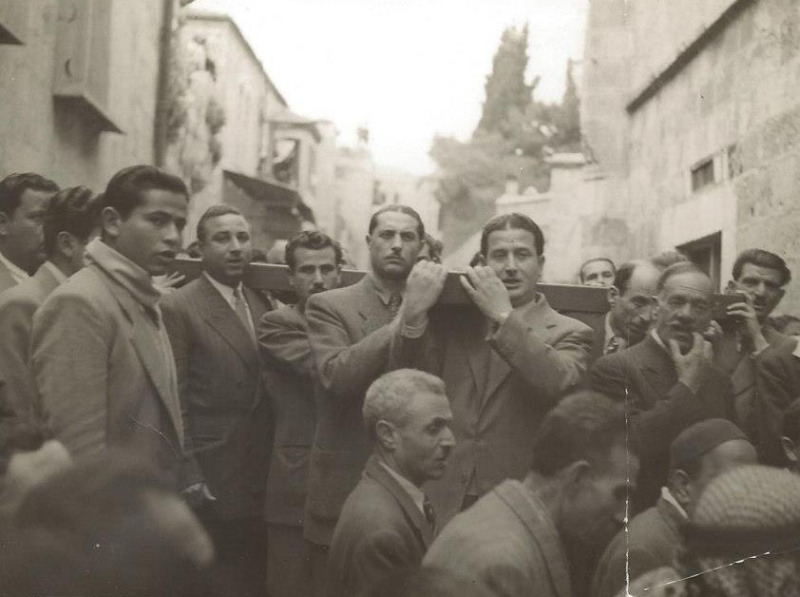 Mousa Kamar's father, Youssef Kamar, right front, carrying the large wooden cross during the Good Friday procession on the Via Dolorosa in Jerusalem's Old City. Kamar's parents had run a family grocery store near the eighth station of the cross, and Graciella Matulleh Kamar, today 83, recalled the pride she felt as she would stand in the doorway of their shop on Good Friday and watch as her husband carried the cross during the procession. Her husband, Kamar's father, was killed during the 1967 war in which Israel took over control of Jerusalem from the Jordanians. "After he was killed, I couldn't watch the procession anymore. It was too painful," she said. Only when Kamar, at age 15, stepped in to fill his father's place was she able to once again watch the procession, she said. "Especially on Good Fridays, my mother would tell me about how my father carried the cross and that one day I would carry it, too," he said. "The first time I carried it I couldn't sleep the night before, I was so excited about carrying the cross and filling that space my father had had." Mousa Kamar, 15, right front, carrying the large wooden cross during the Good Friday procession on Jerusalem's Via Dolorosa. Several years ago, Kamar's oldest son, Youssef, 20, also joined the group of men carrying the cross, but during the procession, he steps aside to let others take their turn. More recently, Kamar's youngest son, Ramez, 15, began taking part in the carrying of the cross. 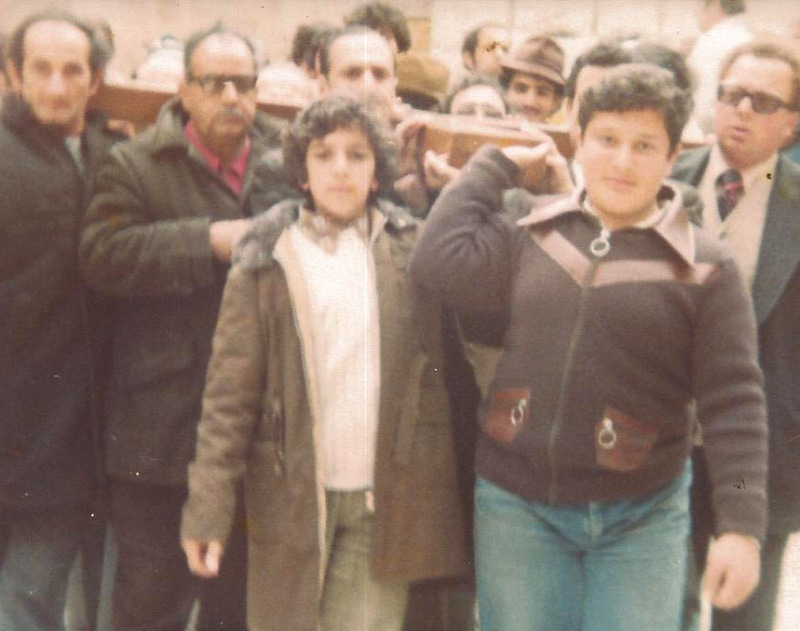 One of the pictures shows a 13-year-old Ramez at the end of the cross, his head barely peeping over the top of the cross among the crowd of men surrounding it. With his dark curly hair and full cheeks he looks just like his father did in earlier pictures. "It was very exciting to be able to carry the cross," said Youssef Kamar. "In the future maybe I and my (future) sons will continue the family tradition. Although this is a tradition, it also helps me feel closer to Jesus and what he went through before being crucified. "It is also a burden and an honor to do this," he added. "Since I was young, I heard stories about this family tradition and, since my father, and his father and his grandfather have done this, I think it is important to keep the tradition and to keep our religion alive." In preparation for the procession, Mousa Kamar spends Holy Week in prayer, visiting the Church of the Holy Sepulcher every day after work and participating in the liturgical ceremonies, including the traditional veneration of the pillar of Jesus' flagellation, the washing of the feet pilgrimage to the Cenacle, and holy hour on Holy Thursday at Gethsemane. "All week I am praying, preparing to carry the cross, linking how Jesus suffered for us to the Palestinian situation. He fought for us, sacrificed himself for us but, unfortunately, we are losing our Christianity. I always pray for that, that people will return to the foundations of Christianity," he said noting that Christians in the Middle East are living a difficult reality with close to 50 percent of the Christian population having emigrated. "We love Jesus and we feel we are a part of Jesus. Every corner, every stone in Jerusalem is directly about Jesus."